To enable us to consistently supply tens of thousands of pallets to our customers, we purchase excess pallets from a variety of different sources. These range from blue chip customers to smaller clients who only have excess pallets to dispose of once a year. Pallets are sorted by size, type and quality before being added to our stock. By accepting such a wide variety of pallet types, we can help to ensure that you will always find the product you need at a highly competitive price when you come to us, in addition to always receive a high quality pallet. Should repairs be required before sale, these will be completed on site. Our stock is currently in excess of 100,000 pallets, but this can vary throughout the year. 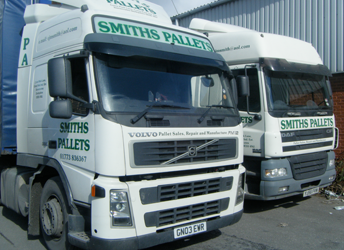 We can collect excess pallets throughout the East Midlands via our extensive vehicle fleet. We can carry full loads of 200 or 450 pallets and all necessary proof of collection documents will be completed and carried by our driver. After the pallets have been sorted on site, we will provide a complete breakdown of the type, value and quality of pallets per load. This occurs on a weekly basis. If you are in the East Midlands, and looking to sell your pallets, please feel free to drop them off at our depot, or send us some photos by email so we can see their condition. We will then be able to offer you a competitive price after we assess and grade them. For larger quantities we can provide a stand trailer enabling your team to load the pallets as they are sorted then exchange trailers. If you have pallets to sell please call us on 01773 836367.